Church tonight started in the dark. We sang a song about Jesus’ death and resurrection. With a big storm outside and soft rain it was a moody way to reflect on the Easter message of redemption. 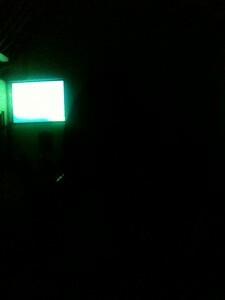 Ironically there was a blackout during the sermon while Mike was preaching new life! He just moved into the pews, lit by mobile phone light and kept preaching. Awesome Jesus! *update* So I wrote the above while I was in the crying room, holding my scared baby to sleep. She was transfixed by the lightning and thunder. Anyway, we finished church and just after we were all heading out the door two cars smashed into each other at the intersection outside the church. Apparently not everything is cool about blackouts – one example being no traffic lights. Videos of the church below.